Created by sticking a toothpick into the pepper from behind .Attaching that toothpick to the black craft paper behind it. 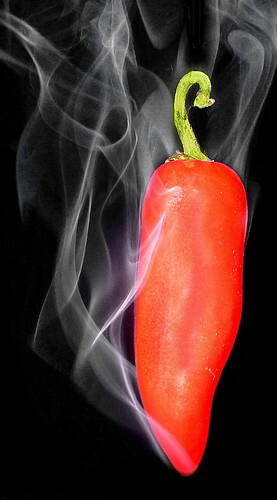 Three burning incense sticks placed under the pepper. Lights off. I had trouble with the flash glare so I used two spot lights facing from each side of the pepper.Took about 12 shots to get one I liked. Post-shot Adjustments may be made to your image in a photo editing program, so long as the modification is applied to the whole image. This includes levels, conversion to black and white, hue/saturation, sizing/rotating, curves and cropping (or their non-Photoshop equivalents). The use of certain editing and adjustment tools is restricted or prohibited as outlined below. Filters: The use of filters (or non-Photoshop equivalent) is prohibited. Spot-Editing: Absolutely no spot-editing is allowed. This includes, but is not limited to drawing tools, dodging/burning tools, and cloning tools. Additionally, the use of any type of selection tool is prohibited except to select a non-feathered, non-anti-aliased rectangular area for cropping. Layers: Only Adjustment Layers (or the non-Photoshop equivalent) may be used. An Adjustment Layer is one that does not contain any pixel data, but rather is a special, non-image layer that lets you experiment with color and tonal adjustments to an image without permanently modifying the pixels. Adjustment Layers must be applied in Normal mode. All other types of layers (including those that contain pixel data or masks) and all other blending methods (modes) are prohibited. Changing the opacity of an Adjustment Layer is permitted. You must submit your original, unmodified photograph and steps to recreate your submitted photograph from your original photograph. This original photograph must contain valid, unaltered EXIF data.